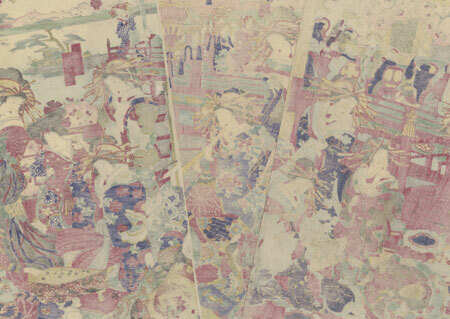 Comments - Attractive scene of courtesans enjoying a variety of entertainments in their leisure time. At right, two women play a game of go as their companions watch. 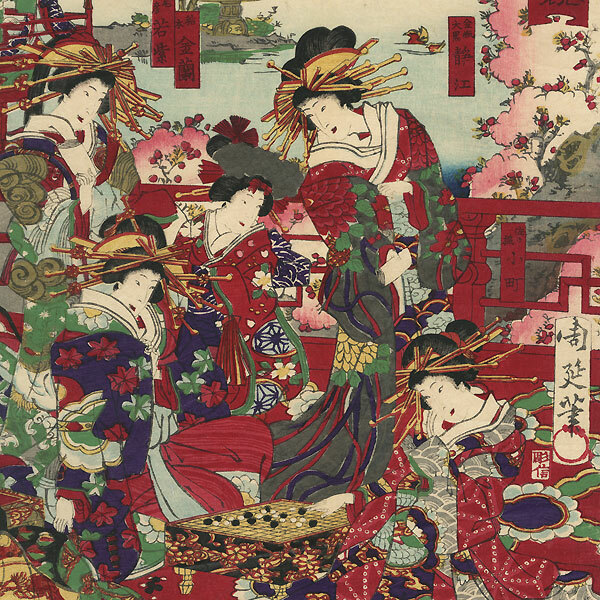 In the center, four beauties play music, using a koto, shamisen, shakuhachi flute, and a kokyu, an instrument similar to a shamisen but played upright with a bow. At left, another woman paints a design on a folding fan. In the room behind them, a group sits around a table taking refreshments. Blossoming cherry trees frame the view of the garden outside. A charming triptych with wonderful detail in the elegant clothing and furnishings, including touches of burnishing, and embossing on the white kimono collars. Condition - This print with excellent color and detail as shown. Three separate panels. Hole, repaired. Slight creasing and soiling. Please see photos for details. Good overall.